NewYork-Presbyterian’s two pediatric digestive care programs—at NewYork-Presbyterian Komansky Children's Hospital and NewYork-Presbyterian Morgan Stanley Children’s Hospital—focus on the very specialized needs of infants, children, and adolescents with digestive disorders. Our pediatric gastroenterologists are at the forefront of advances in diagnosing and treating children’s digestive diseases. Through our multidisciplinary approach, we provide you with access to some of the nation's best doctors, the newest technologies, and advanced therapies for children of all ages. 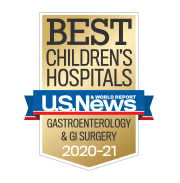 Collaborative Teamwork: Our programs for children integrate the expertise of top-tier pediatric gastroenterologists in New York City with that of other supporting digestive specialists and experts in the full range of related fields. They collaborate to understand your child's illness, evaluate all relevant treatment options, and develop a fully integrated, coordinated plan of care. Child-Friendly Facilities: To ensure that you and your child are comfortable and relaxed while in our care, we have created cheerful treatment and waiting areas with child-friendly equipment and accommodations; pediatric sedation units and procedure rooms with state-of-the-art equipment designed specifically for children; and rooms where you can stay overnight with your child. Skilled Surgery: Our surgical teams are highly experienced in procedures ranging from the relatively simple—an appendix removal, for example—to the highly complex, such as small bowel or liver transplantation. We are a referral center for surgeries that are not widely available elsewhere, including weight loss surgery for adolescents. Whenever possible, we use minimally invasive techniques, resulting in smaller incisions, less discomfort, and a quicker recovery for your child. Centers of Expertise: We provide the most up-to-date diagnostic services and the most effective therapies through dedicated clinics and special programs for children with digestive problems such as fatty liver disease, aerodigestive disorders, celiac disease, allergic diseases, and inflammatory bowel disease. Nutritional Guidance: We will work closely with you to address your child’s nutritional deficiencies and help you and your child establish manageable, healthy dietary changes that will help him or her to thrive. Partnering with Families: When your child has a digestive disorder, the entire family is affected. We are committed to working closely with you through each step of the treatment process, providing support as well as resources to help you understand your child's illness and enabling you to be an active participant in your child's care. Transitional Care: Your child's illness may be the kind that requires lifelong vigilance, special care, and follow up. Our transition program is geared to help adolescent patients take charge of their own medical care when the time comes to move from pediatric to adult health care. We can facilitate a referral to the appropriate adult-care physicians when that time arrives. Leading Research Studies: Researchers here participate in a broad range of investigative activities exploring digestive disorders that can affect children. Our projects include the studies of the gut microbiome, intestinal inflammation, adaptive immunity, liver injury and liver fibrosis, and the link between autism and digestive disorders.